Taras. ca 302 to 281 BC. Silver didrachm. Taras is in Calabria in southern Italy, and is also known as Tarentum. Denomination : Silver didrachm (sometimes called a Nomos). Date : 302 to 281 BC according to Sear, and 302 to 231 BC according to Svornos. Size : 20.4 x 21.8 grams. Weight : 7.82 grams. Reference : Sear-363 variety. Vlasto-666. Grade : VF/gVF, some light die deterioration. 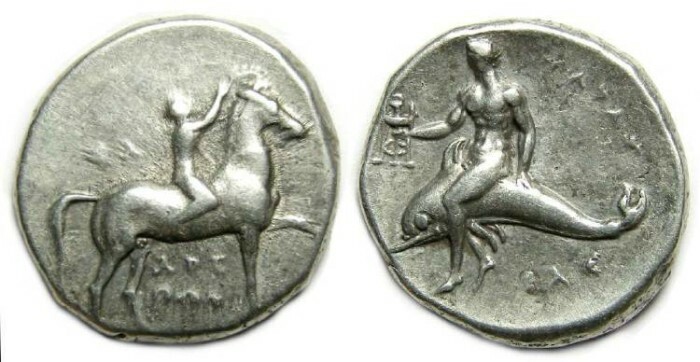 Obverse : Naked horseman riding right, holding a wreath over the horse's head, with AREQWN below. Reverse : Taras seated left on a dolphin, holding a small tripod TARAS in the upper right, with CAS below. For reasons I do not understand, it has become fashionable to call this coin denomination of nomos. The Greek word "nomos" appears to simply mean "acceptable currency" and is more an accounting term than the name of a specific coin type.